Bruce Perry's compellingly-named book is one of two that I personally feel should come out of the womb with every child that is born (the other being Alice Miller's, For Your Own Good: The Roots of Violence in Childrearing). Written in 2006, it charts Dr. Perry's journey through some of the most difficult cases that a modern child psychiatrist will ever have to grapple with. As his narrative progresses, he clearly outlines the impact of all of the abuses these children suffered on their brain development - and importantly, helps the reader understand how these problems can be caught and even reversed. Some of the cases covered include: a case of a child who witnessed her mother's murder at age three and whose own throat was slashed, children involved in a satanic ritual abuse panic in Texas, the children evacuated from the Branch Davidian compound during the siege in Waco, the eponymous boy who was raised by his uncle (who was a dog trainer) in a cage, and a child whose mother had Munchausen's syndrome by proxy and came very close to killing him. Also in the book are cases of the kind that we hear about more often: a child who had experienced sexual abuse from a very young age, a teenager who would cut herself, and a young boy who was adopted from an orphanage in Russia where he was kept in a crib for the first three years of his life. Perhaps the most compelling cases involved a teenage boy who committed an atrocious murder at sixteen, and was facing life in prison. He had been drinking, and killed two teenage girls who lived in his building. He then violated their bodies. Perry was called in by the court to assess the boy, and met with the family to see if they could provide insight into what happened. His older brother was married with a stable job and a family, so the problem was unlikely to be genetic. He realized that father and brother were being protective of the mother, and speaking for her, and when he pressed a little he realized that the mother was of below-average intelligence. She had become pregnant in high school, and had her first child when she lived with her family. When she was unable to care for the child, there was always someone there to take care of the baby. Circumstances had changed by the time the second son was born. She moved with her son and now-husband to another city, away from her family. She had little idea of how to care for her newborn, and would feed and change him in the morning and then go on long walks with her other son, abandoning him for hours at a time. It was at this time that Perry suspects that the boy's ability to form bonds or to feel empathy failed to develop. With no adults around him whom were able to provide nurturing, attentive care, the boy developed into a sociopath with a marked ability to charm the people around him, but with no capacity for empathy - or to even understand empathy: as he was being led away following his sentencing, the boy wondered to Perry that about why his family was crying, when he was the one who was going to jail. This and the other cases in the book have important implications for our approach to raising children, and brought something up that I had wondered about before. I have often wondered why it is that cases of serial murders and similar sociopathic criminals were so much more common in the West than in the Middle East and Southeast Asia, were I did my growing up. One possible answer may lie in the understanding of "family" to mean "nuclear family," rather than "extended family." For better or worse, children in most other parts of the world are surrounded by, or actually live with, a host of relatives with whom they are in constant contact. One result may be that fewer of them fall through the cracks and develop sociopathic tendencies as a result of abandonment or a lack of nurturing relationships when young. Perry had the sense and humility to write the book with a co-author, who I assume helped him frame the story and make it accessible to laypeople that had no medical or psychiatric training. 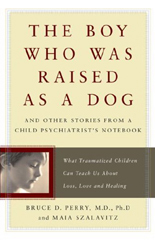 The result is a compelling, insightful and profoundly important book that clearly outlines the lessons to be learned from how these children were failed, and perhaps the most important lesson of all: that recovery from all but the worst forms of abuse or neglect are possible, in the presence of early enough intervention and a safe and nurturing relationship with an adult or adults. The Quarterly Newsletter of the International Psychohistory Association.